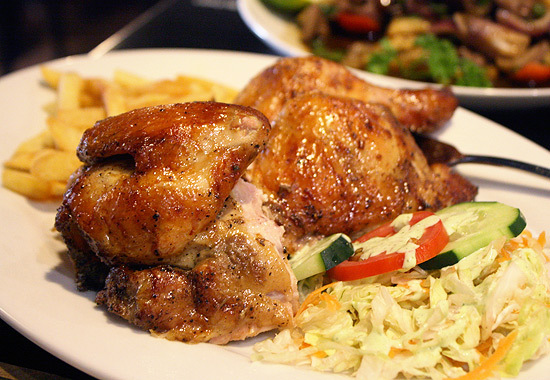 You won't get over Peruvian-style chicken and rice after this gastronomic experience. (SPOT.ph) There is nothing so exotic about Peruvian cuisine that Filipinos would find it too weird for their palate. 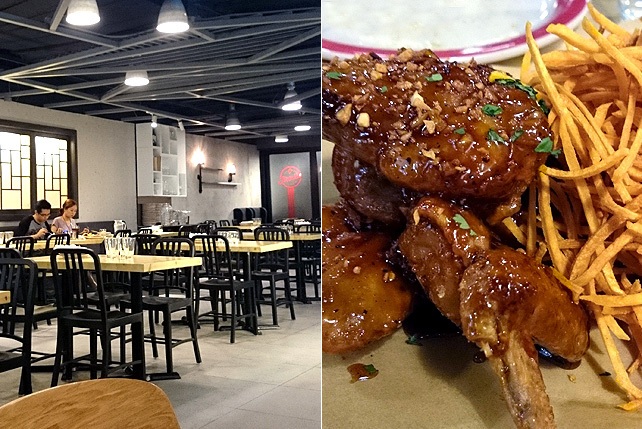 Don Andres, a name that people might actually associate with Spanish or Filipino, is essentially a place for those looking for good-nay, delicious food and a great ambiance. Plus a lot of South American flair. Co-owner Warner Lee says this much about their food. Their Pollo a la Brasa (P150 to P165/quarter, P300 to P330/half, P590 to P650/whole), for example, fast becoming their most cultish dish, is your usual roasted chicken but marinated differently and painted with specific spices-techniques that are, of course, kept under wraps from our prying taste buds. Warner would only go as far as to say that their ingredients are all authentic, which is how their chef, himself a Peruvian who grew up in Japan (a country with a large Peruvian community) wants it. Beneath the glossy brown chicken skin is tender meat that’s gone pinkish (but perfectly cooked) from a 24-hour session in the super-secret marinade. 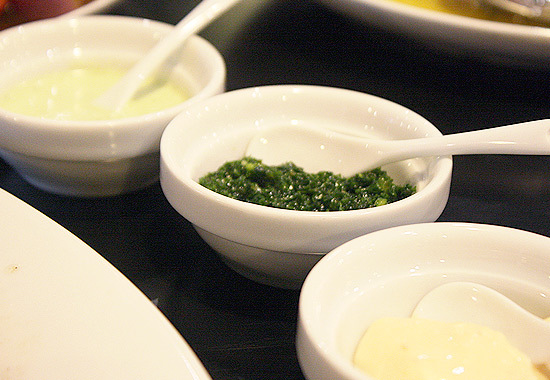 The flavor, some tang, some pepper, some smoke, some salt, is light, but enough to still tempt you to dip it in the trio of sauces: a chunky chimichurri, a tingly aji verde sauce, and a zippy chili mayo. The trick, one of the few that Warner is willing to share, is to mix them all together with the chicken to create a multidimensional flavor, various layers of spice with a pop from the herbs. We are digging the bar. 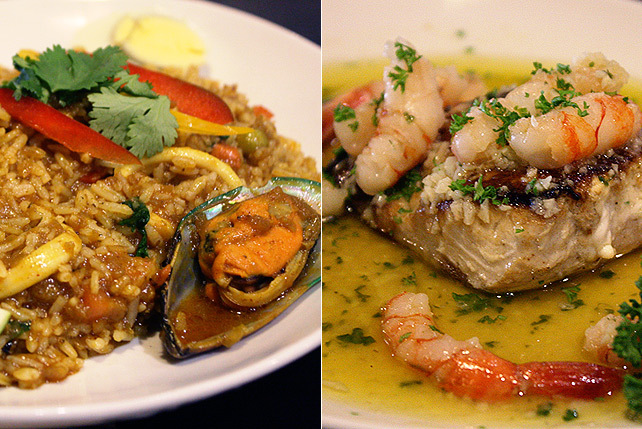 Don Andres opened back in 2013 in Scout Tobias, a small place with just the chef and his wife. They moved to their new location on Sergeant Esguerra only last November, with new partners and a chic new look. 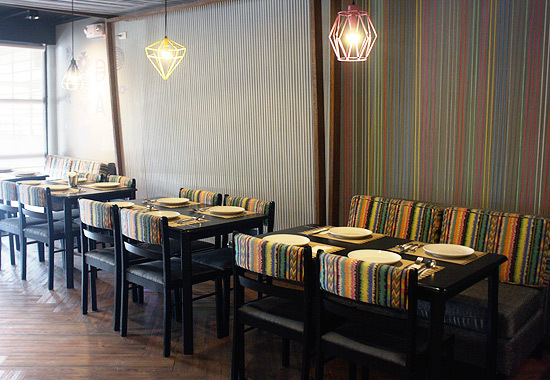 It’s modern but still festive: a-not-so literal take on the Peruvian culture relayed through lively colors from quirky cage lights and striped furnishing that brighten the rather dim setting. The hefty servings and bold flavors seem ideal to share with a group, but the row of stools at the bar gives you space to privately enjoy this side of South America. 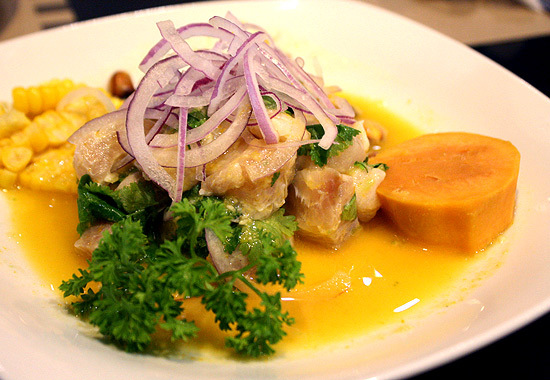 One’s generosity, for example, would be challenged with the Ceviche de Pescado (P280). Chunks of talakitok fish swim in a vibrant citrus juice that’s spiked with just a whisper of heat. The sweet potato, sweet corn, and canchas (toasted corn which closely resembles semi-popped popcorn) on the side do more than adorn. 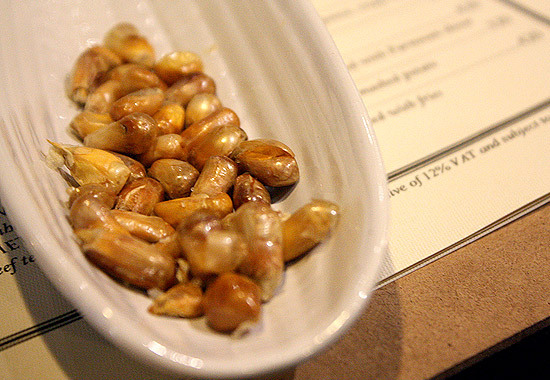 Toss them all together (yes, mash the corn and stir in the onions, too) to get a full-bodied bite-crunchiness, tenderness, chewiness. The sweet potato, with its sweet starch, evens out the acidity, allowing you to finish this dish with ease. 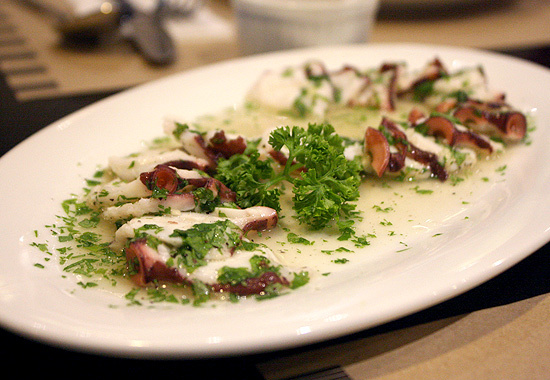 The Pulpo Al Olivo (P290) is art on a plate, a large tentacle chopped and gracefully laid out over a tangy yellow juice. Saltine crackers serve as the throne for this crostini-type dish, where the sliced octopus receives a crown of thick Botija olive sauce to a summery and earthy result. 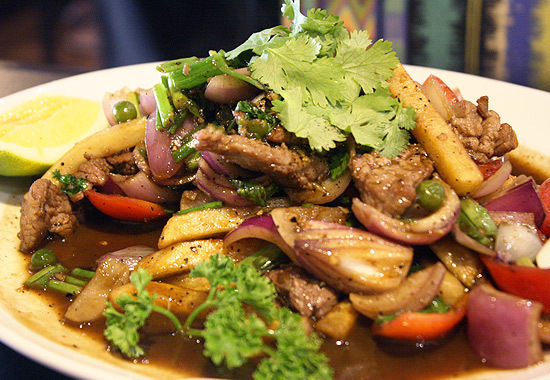 This kind of cuisine, as we’ve only begun realizing, uses ingredients freely to assure every bite gets that exceptional summary of flavors. 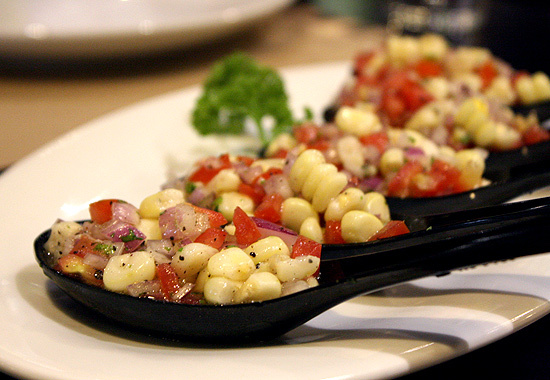 The Choros a la Chalaca (P320) is served in five spoons, all filled with little hills of white corn, onions, and chilis. Underneath, like a hidden pearl, is a juicy Peruvian mussel that’s highlighted in all the right ways by the smorgasboard of toppings. Stuffing an entire spoonful in one bite isn’t the most attractive look, but it’s the only way to really get the interplay of elements, especially that tail-end of heat after the loud tanginess. The menu is quite basic, only three pages, with the last one dedicated to beverages. Warner explains that they wanted to prioritize quality over anything else, and their focus on flavor shows in the Arroz con Mariscos (P380). 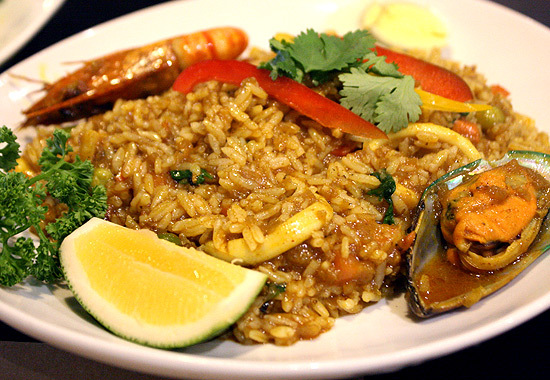 This rice dish is moist but not rich, finding itself somewhere between a paella and a risotto. It’s not your usual salty or savory or decadent; it doesn’t even radiate the flavor of the plump shrimp or delicate squid that reveal themselves under the grains of rice. You can tell that it’s laboriously seasoned, hints of smoky paprika, mellow cumin, and kicky turmeric standing out, but Warner only reveals that it’s a special Peruvian spice mix. Bright, spirited, unfamiliar yet pleasant, one steaming spoonful is something you have to experience to really understand. Though the Arroz con Mariscos is one of the dishes you’re probably going to order again, it might not be too wise to pair with the Lomo Saltado (P420) which is quite assertive on its own. The strips of tenderloin lean toward the saltier side so best to have it with the pieces of sweet onion and tomato to act as a foil to that bold flavor. Amid the big blasts of flavor shooting from all over the menu, the Pescado al Ajillo (P420) seems a little too timid. 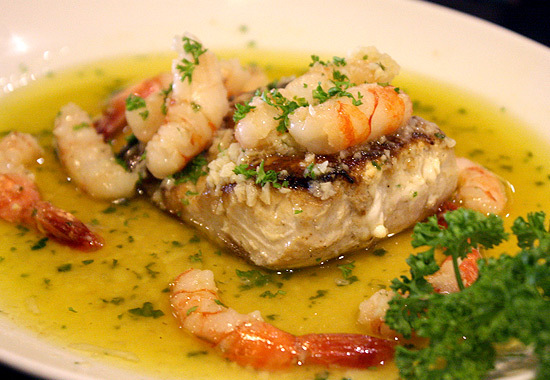 The slab of flaky white fish wades in olive oil and piqued up by lemon and garlic. 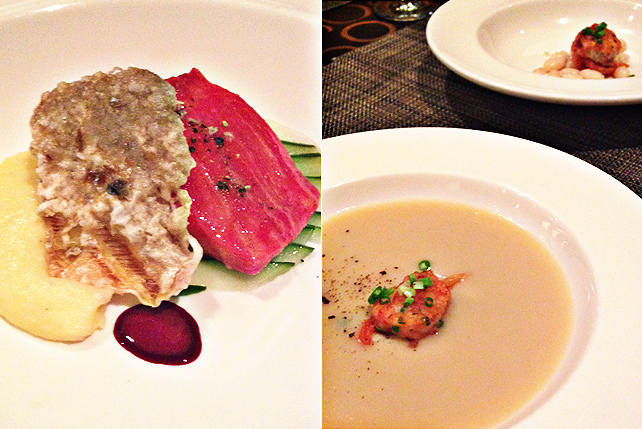 The fish has a different kind of appeal: softer, muted, but not weak. While it may not be the liveliest of all the dishes you’ll find at Don Andres, it’s definitely a good pitstop from the intensity of everything else. Or, there’s dessert, something sweet to curb and cleanse the palate. The Pie de Limon (P145) or Peruvian-style key lime pie, will make your taste buds stand up and pay attention. It’s incredibly light, with that right amount of tart to refresh your senses. 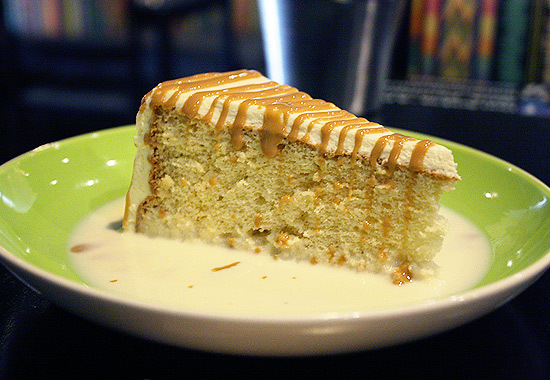 The Tres Leches (P165) has a different effect-subtle, graceful sponges of cake that have soaked up so much milk that a forkful just dissolves into a delicious sweet nothing in your mouth. 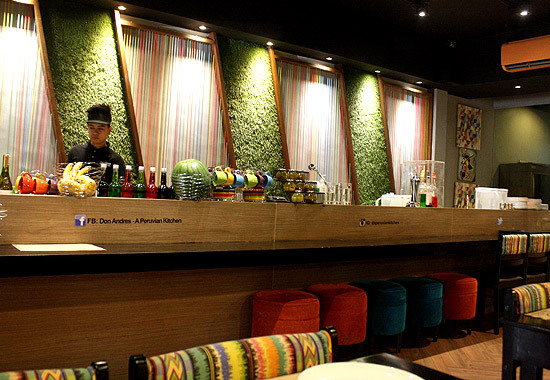 Peruvian cuisine is largely underrepresented in Metro Manila, and until Don Andres, we never really thought too much about it. But those bright flavors will be too hard to ignore. In fact, we still can’t stop thinking about them.